A pair of short stories about greed, charity, life and death from one of Russia's most influential writers and thinkers. This was completely gorgeous, and a stellar addition to the Little Black Classics range. I haven’t read a great deal of Tolstoy in my time, but experiencing the style of both short stories has really encouraged me to seek out more of his work. How Much Land Does a Man Need? explores greed in relation to ambition, implying that man is never happy with his own lot, and is constantly aspiring to achieve more. It seems a noble pursuit, but Tolstoy likens it to greed, and states that man can only push so far when bettering his station, and must at some point become content. The style was beautifully simplistic, yet had an overarching tone of wisdom, allowing us to clearly understand the peasant’s mistakes in trying to overreach. 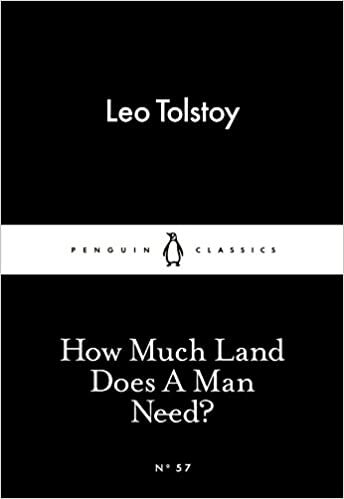 Tolstoy ends the story in an apt yet brutal blow, showing us exactly how much land this man needed in the end. The second story in this collection, What Men Live By, was hugely different from its companion. Focusing more on the power of compassion and love, it’s a tale of helping others in their time of need. Although I found it strange to begin with, it was utterly compelling and beautiful once I’d found my feet. I particularly enjoyed the contrast between the two stories, and feel this was a clever move by Penguin when deciding which story to include alongside the titular item. Both engaging, both exploring the behaviours of man, yet so markedly different in approach. This is one of the best inclusions in the Little Black Classics range, without a doubt.